It consists of 1 bedroom, bathroom, fully equipped kitchen and dining room. The apartment consists of 1 bedroom, the living room has a table for dining, sofa bed and TV. Guests can prepare meals in the fully equipped kitchen which includes a dishwasher. The apartment has air conditioning and free wifi. The surrounding area is the lively neighborhood of Sol, a great choice for travelers interested in nightlife, tapas, architecture and performances. 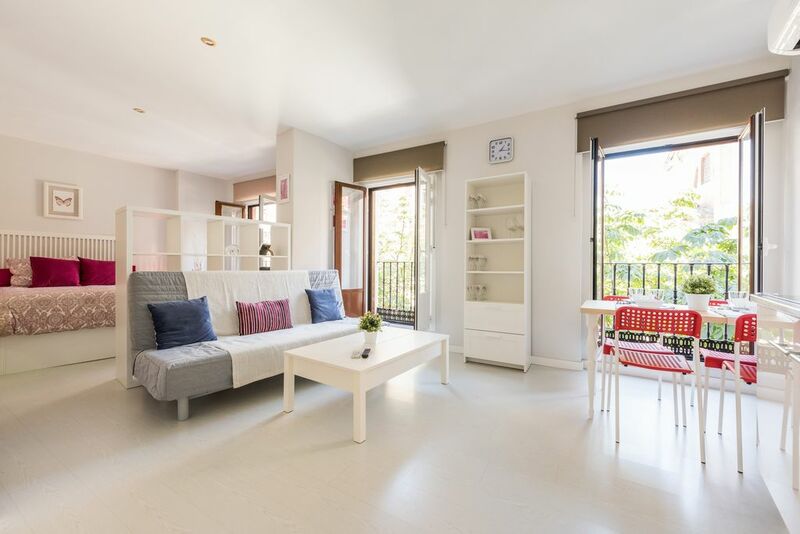 Sol, Tirso de Molina and Anton Martin metro stations are 5 minute walk away. Sol and the Plaza Mayor are just a 3 minute walk. The location is fantastic, but noisy. Isa was very responsive before and during our stay. When greeting us, she seemed in a hurry to get somewhere else, so we didn't have a good introduction. Both nights of our visit, there were loud voices which awakened us. The bed is comfy, but the apartment is not suitable for two people with different waking schedules. Overall, the apartment is adequate, but nothing special. Simple, clean, and in a fantastic location that gets you to plenty of attractions by foot or on the local Metro. The owners were fast in responding to any questions throughout the booking. Super friendly, too and left us some nice treats as a welcome to our stay. Thank you! Close to public transportation, restaurants, grocery store. Beautiful, well equipped apartment. Friendly and attentive owners. I've already shared this location with friends. You just can't get a better location--walking distance to EVERYTHING the historical center of Madrid has to offer: the Prado, Plaza Santa Ana, The Royal Palace, The Parque del Retiro, the Gran Via, etc. etc... Yes, as some others have said, a bit noisy at night, but it is Madrid, so anywhere you stay will have the same issue. That being said, my wife and I slept soundly. The 'kitchenette' is adequate but could use some more practical things--such as a bottle opener, a wine opener, and kitchen towels. There is an abundance of glasses, but without a beverage opener, they will sit unused... The bed was very comfortable, and although the bathroom floor could've used a bit more cleaning before we arrived, overall we found the apartment to be cozy and well suited to our days and nights. We would gladly stay there again!